The revised and extended A4 version is great. As you would expect, it introduces you to the C major scale and breathing exercises straight away, before tackling Oh Susanna and Amazing Grace in first position. With the basics familiarised, Mr Kinsella moves into cross harp using the basic, bend-free, blues scale 2D 3D 4B 4D 5D 6B with more exercises. Two lovely blues tunes follow, Easy Street and Trouble Free Blues, both of which educate the newcomer in the art of chord changes and promote technique building such as glottal stops, short runs and repeated blues licks across holes 1 and 2. The tunes can be challenging at first, but they help to build important foundation skills. Next comes note bending. Exercises and study pieces for holes 4 and 6 draw bends are tackled first, followed by the more difficult 3 draw and 2 draw bends, complete with a selection of riffs. Full tone and part tone bends are then explored before moving into direct bending and additional riffs using the full blues scale 2D 3D’ 4B 4D’ 4D 5D 6D and back. With the bottom end charted, later lessons focus on blow bending in holes 7, 8 and 9. These are dealt with in short order compared to the draw bends. Some more information on blow bend technique would be beneficial, however there is always the CD to listen to for guidance. Wah-wahs, head rolls and tongue rolls are mapped out next, although in my opinion tongue rolls are a slight red herring. Then throat vibrato, jaw vibrato and finally note splitting. The last study piece, Lake Shore Drive, draws all the newly mastered skills together over a wonderful concluding Chicago shuffle. Mick Kinsella guides you expertly through the essentials of blues playing with clarity and in a musical way. The tab doesn’t just comprise arrows and numbers, it has formal notation too. This is good. Newcomers should learn to associate their playing with traditional score, complete with note values, rests and time signatures. The study pieces are not designed as backdrops for special effects. They help to build an understanding of how tunes progress through chord changes towards resolution (unless of course you’re vamping over a mesmeric one chord wonder such as Shake Your Hips or Boogie Chillen). There are still one or two typos in the tab and scores, but you’ll quickly spot and correct them for yourself. My only suggestion for improvement is that when the package is updated, the study pieces and exercises on the CD would benefit not just from Mick’s examples, but also from shadow tracks. This way students can build confidence playing along in tandem before venturing into their first solos. Worst instructional material I’ve come across was a DVD called “Beginning Blues Harp” by Irish harmonica player Don Baker. He’s a skilled player with a distinctive Caeltic folk presence in his style, but he can’t teach worth a damn. This is the package I started learning from. The lessons are great for learning to move around on the instrument, and for really getting the hang of those bends until you can do them in your sleep. Unforgiveably though, he doesn’t even hint at the form and function of blues music. You can learn a bunch of instrumental ditties right offa ole Don, but won’t have the faintest idea about things like chord changes, 12-bar structure, etc. Thinking back on it, I could swear for the early lessons (he begins by focusing on holes 6 – 4, working down rather than up) he has his students playing in in third position without even telling them. Ultimately I emerged from this instructional material a lot more mobile on the harp and with the ability to bend, but utterly ignorant of even the fundamentals blues music. Now that I’ve learnt from other material (Dave Barrett, Adam Gussow, etc) I scarcely use anything I learnt from Don Baker. Maybe I’ll go back some day and draw on his phrasing here and there, but for the 20 euros I paid at Virgin Music for his DVD, I’ll remember him as a great player but a useless teacher with tacky dress sense and an overpriced and completely misconceived product. 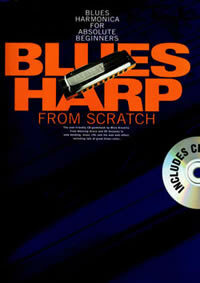 I am useing Blues Harp From Scratch and think it is a very good instruction to the Harp.Been learning about a year now and would recommend this book.